Fred Sewell was born in Market Bosworth, Leicestershire in 18912, the youngest of seven children of Thomas (b. c1850, Silverstone, Northamptonshire) and Susanna (b. 1847, Silverstone, Northamptonshire née Williams). In 1891 the family, including the six oldest children was living on Burton Road, Market Bosworth, Leicestershire with Thomas working as a woodman3. Two years later, in 1892, their family was complete when Fred was born. In 1900, his mother Susannah died age only 524. By 1901, Thomas, now a widower was living at Congerstone, Leicestershire with Daisy, his eldest daughter keeping house and two of the younger sons, including Fred, still at home.5. By 1911, only Thomas and Fred were left at the Congerstone home. Both were working as general labourers6. Fred's brother George (b. 1876) had joined the Army in 1894, first with the Leicestershire Regiment Militia before enlisting as a regular soldier with the regiment's 3rd Battalion, for a term of twelve years (including 5 years in the Reserve). From October 1899 to June 1900, after training as a mounted infantryman, he served in South Africa during the Second Boer War and received the South Africa Medal. He was transferred to the Reserve in 19027 and, in 1904, he married Bertha Weightman8. By 1906 they had moved to Beeston, Notts where George found work at Beeston Foundry (which later became Beeston Boiler Company). In 1911, he and his wife and three children were living at 7 Derby Street, Beeston with George working as a moulder9. George and his family were to continue to live in Beeston for the rest of their lives and it appears that it is through George that his brother Fred is remembered on the Beeston memorial. However, as Fred enlisted in Nottingham and declared his occupation as 'Iron foundry labourer' there is the possibility that he lived with his brother's family in Beeston for a short time. When war came in August 1914, Fred enlisted almost immediately, joining Kitchener's New Army with the Leicestershire Regiment on 1 September 1914. After training with 8th Battalion, he left for France on 29 July 1915 with 9th (Service) Battalion as part of 110th Brigade, 37th Division10. Composed of four battalions of the Leicestershire Regiment, it was also known as the Leicester Tigers Brigade - from the Bengal tiger hat badge worn by the Leicestershire Regiment. These battalions, composed as they were of inexperienced soldiers led by equally inexperienced officers needed time to develop the fighting skills required. They were keen and enthusiastic and fought bravely in the actions they were involved in during these early months - indeed Private Sewell received grenade injuries in September. In July 1916 the whole brigade was transferred to 21st Division to help them acquire these skills alongside more experienced men. Although the battalion was not directly involved in the major Somme offensive on July 1 1916 - it was used in a diversionary action - it did, as part of 21st Division take part in the Battle of Bazentin Ridge, a further phase of the Somme battles. The battalion fought strongly in a very bitter battle but there were very heavy casualties - 18 Officers and 394 Other Ranks. Amongst those who were injured was Private Sewell who received a gun shot wound. After being passed through the evacuation chain - 23rd Field Ambulance to 45th Casualty Clearance Center and to 11th Stationary Hospital at Rouen - he was evacuated to England, on 17th July, aboard the Hospital Ship Marama, for treatment and convalescence. Although he had clearly been badly injured and he, along with his colleagues had had terrible experiences, such were the demands for men at the front, that as soon as he was sufficiently recovered, he was returned there to face more horrors. Fred arrived back in France on 29 February 1917, this time with 11th Battalion, a Pioneer Battalion which was under the orders of 6th Division. Although no longer required to face the dangers of 'going over the top', he and his colleagues still had to face great danger, often near to the front line. In August 1917, the battalion was in support of the successful Canadian attack at Hill 70. In October 1917, the battalion was involved in the construction of a light railway near Dickesbusch in the Ypres Salient, an arduous and dangerous task, given that it was working within range of enemy shelling and there were numerous casualties. In December 1917, the battalion was in support of the attacks during the Battle of Cambrai where new ideas and new technologies were deployed for the first time11. During March 1918, the battalion was near Vaulx-Morchines in support of the line. A major attack by the enemy had been expected for some time as enemy positions had been strangely quite. Then, on 21st March, the German Army launched its Spring Offensive from the Hindenburg Line with the objective of ending the war before American troops and resources could tilt the balance towards the Allies. The objective was to smash through the Allied lines, push the British forces into the sea and to cut off their supply lines by seizing the ports. The enemy attacked heavily after an intense bombardment which lasted from 5am to 8am and had established themselves in position in front of the wire by the evening. The battalion suffered heavy losses, including all the battalion's officers and the remaining men from the battalion alongside those that were left from 110th Brigade, were left in the defence of Epehy fighting on resolutely and stubbornly against devastating rifle and machine gun fire. When night fell, only at one point had the enemy succeeded in piercing the line12. Sadly, Private Sewell did not survive this terrible battle. Having no known grave, Private Sewell is remembered on the Arras Memorial in the Faubourg-d’Amiens Cemetery which is in the Boulevard du General de Gaulle in the western part of the town of Arras. The cemetery is near the Citadel, approximately 2 kilometres west of the railway station. The Faubourg-d’Amiens Cemetery was begun in March 1916. It continued to be in use by field ambulances and fighting units until November 1918. After the Armistice the cemetery was enlarged when graves were brought in from the surrounding battlefields and from two smaller cemeteries in the vicinity. The cemetery contains 2,651 burials from the First World War. The Arras Memorial commemorates almost 35,000 soldiers from the United Kingdom, South Africa and New Zealand who died in the Arras sector between the spring of 1916 and 7th August 1918 and have no known grave. 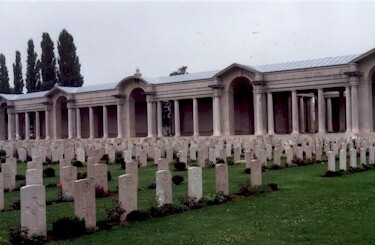 The most conspicuous events of this period were the Arras offensive of April-May 1917, and the German attack in the spring of 1918.The cemetery also contains the Flying Services Memorial which commemorates nearly 1,000 airmen of the Royal Naval Air Service, the Royal Flying Corps, and the Royal Air Force, either by attachment from other arms of the forces of the Commonwealth or by original enlistment, who were killed on the whole Western Front and who have no known grave13. Private Sewell was posthumously awarded the British War Medal, the Victory Medal and the 1915 Star14. Fred's father, Thomas Sewell, had died in March 1917 and, as a result, Fred's Army financial effects of £23 0 8d, including his War Gratuity of £20 10s, were paid to four of his siblings on 19 August 191915. Happily, others in the family were able to continue their lives. Fred's eldest brother, John Thomas Sewell, had married Fanny Elizabeth Archibald in 1898 and they had set up home in Nuneaton, Warwickshire where John worked for all of his career on the railway and where he died in 1951. His younger brother Bertie married Mary Ann Hodgkinson in about 1907 and also followed a railway career in Nuneaton before his death in 1955. Their eldest sister, Margaret Daisy Sewell, married Eli Smith in about 1903 and they lived out their lives in Leicestershire. Both Emily Ethel Sewell and Violet Sewell had taken positions as domestic servants by 1911 and Emily is known to have married Albert Victor Ludlow in 1917 in London, where they lived out their lives16. George Sewell and his wife and family had moved to live at 11 Dagmar Grove, Beeston by 1917 and they had moved to 68 King Street, Beeston by 193017. He continued to work at Beeston Foundry (later called Beeston Boiler Company) for the remainder of his working life and, at various times he was joined there by his sons - William Thomas, George, John Arthur and Frederick18. George died in 1960, followed by his wife Bertha in 1969. They are both buried in Beeston Cemetery with Bertha's parents, William and Elizabeth Weightman19. 3Market Bosworth, Leicestershire, 1891 Census, Piece 2506 Folio 7. 6Congerstone, Leicestershire, 1911 Census, Piece 19035 RD403 SD1 ED8 Schedule 88. 7His Militia Attestation and service record survive in the National Archives (WO 96 358 93). His Army Service Record survives in the Chelsea Pensioners Records. Both are available at findmypast.co.uk. 9Beeston, Notts, 1911 Census, Piece 20426 RD429 SD3 ED1 Schedule 134. 10Details of his enlistment and service are from his Army Service Record which can be found at ancestry.com. 14Details from Fred's Medal Card - available on ancestry.com. 15Details from "Army Register of Soldiers' Effects, 1901-1929" - available on ancestry.com. Two sisters appear to have been omitted from the distribution. 17George's family addresses are from Fred's Army Service Record and the 1930 Electoral Roll.